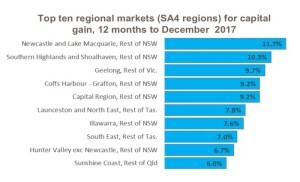 The Newcastle and Lake Macquarie district has been ranked as having the strongest capital gains of any regional property market across Australia in 2017, according to the latest CoreLogic data. It had 11.7 percent annual growth, which easily outperformed Sydney’s 3.1 percent annual price growth during 2017. The regional locations – north of Sydney – were followed by the NSW Southern Highlands and Shoalhaven (up 10.3%) and then Geelong, outside Melbourne, (up 9.7%). In April last year Property Observer columnist Terry Ryder advised that “those who find Sydney a tad rich don’t have to go too far to find major markets” with greater affordability and good growth prospects. Ryder also twice identified Geelong as a a locality with potential including mid-year when he wrote that the Geelong economy was performing strongly and its property market thrived as a cheaper alternative to Melbourne. The weakest regional markets continue to be in Australia’s outback regions and areas dependent on the mining sector, according to the latest CoreLogic update. The largest fall in dwelling values over 2017 was recorded in Outback Queensland, a region which encompasses a vast but sparsely populated area of western Queensland, where dwelling values were down 14.3% in 2017. Rounding out the top five for largest value falls across the regional areas of Australia were Darling Downs–Maranoa in Queensland (-8.2%), Outback South and Outback North in Western Australia (-7.6% and -7.3%) and Townsville in Queensland (-5.6%). 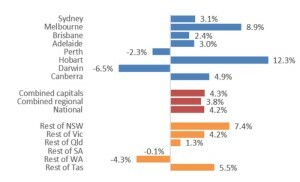 Across Australia, Tim Lawless at CoreLogic confirmed that the 2017 shift to falling national dwelling values was being driven by the capital cities, with the combined capitals tracking half a percent lower over the December quarter, while across the combined regional areas of Australia, values were half a percent higher over the quarter. Amongst the capitals, the weakest end of year conditions are concentrated in Sydney and Darwin. The city’s annual rate of growth is now tracking at just 3.1 percent; which CoreLogic’s Tim Lawless noted was a stark difference to the recent cyclical peak when values were rising at the annual rate of 17.1 percent only seven months ago. Despite the reversal in growth rates since August 2017, Sydney dwelling values remain 70.8 percent higher than their cyclical low point in February 2012. The best performing capital city over the 2017 calendar year was Hobart, where dwelling values rose by 12.3 percent: almost five times higher than Hobart’s decade average annual rate of capital gain (2.5 percent). Despite the strong capital gains, housing prices remain extremely low in Hobart relative to the larger mainland capital cities, with the median house value tracking at $424,251; 54 percent ($634,000) lower than Sydney values and 49 percent ($408,000) lower than Melbourne.